My Hours Productivity Tracker App. An app for keeping track of work hours and increasing your productivity. Track time, generate reports and invoices, track productivity. You and your employees can track time and productivity effortlessly. A single click starts the productivity tracker app and you can begin working on your project or task at hand. Manage your time and focus on projects and tasks that are worth your time and money. Find out where the flaws are in your company and start working toward repairing them. Generate detailed time reports, that act as guidelines for future planning or prove your hard work to your clients. Reports are visually pleasing, easy to read and made with business needs in mind. By tracking time, you are saving time. By tracking productivity, you are saving money. Track and save both with My Hours Productivity Tracker App. Track time on specific projects and tasks. Get exact time tracking status reports. 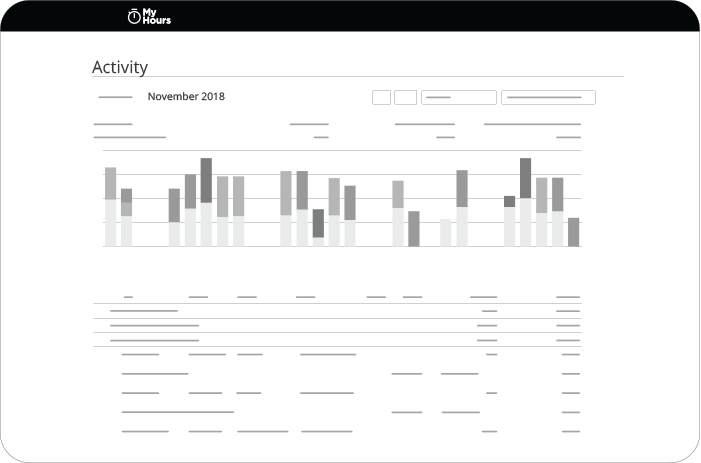 Accurately track productivity of your team. Remove non-essential projects or tasks. Track productivity by comparing time used for specific projects. Eliminate the time-consuming and non-profitable projects you raise your productivity levels. 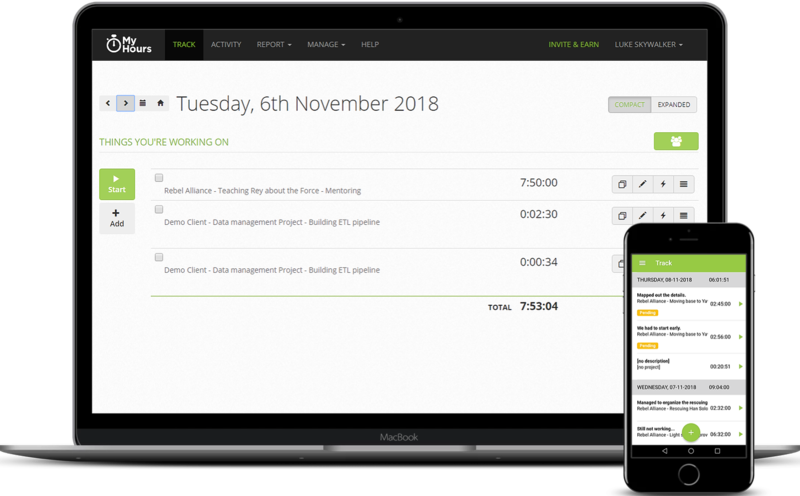 Know exactly how your time is used by tracking it on your projects and tasks in real-time. Allocate your time wisely according to the detailed time reports produced with My Hours and boost your efficiency. My Hours is a cloud-based solution. Use the web app and don’t get tangled up with lengthy installations and software maintenance. Track from anywhere, My Hours is available for Android and iOS devices. Have a clear insight into your team performance. Administrator privileges allow further inspection of your employee work. Simple and easy to use. With My Hours, time and productivity tracking stops being a pain and becomes an effective habit. This service allows me to keep permanent detailed records, and my clients know they can ask for the information if they want to review how I spend my time. 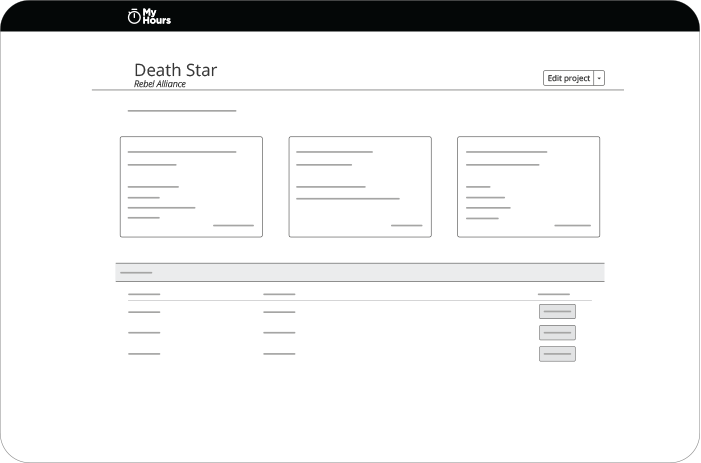 It’s easy to keep track of clients, and projects, and appreciate the report options. It helps me determine where and how much time I’m spending for each client – very helpful when billing. Always appreciate the prompt responses I receive when I have an issue or question.